As of v2.0, our popular visualizers, displaCy and displaCy ENT are finally an official part of the library. Visualizing a dependency parse or named entities in a text is not only a fun NLP demo – it can also be incredibly helpful in speeding up development and debugging your code and training process. If you’re running a Jupyter notebook, displaCy will detect this and return the markup in a format ready to be rendered and exported. What about the old visualizers? The quickest way to visualize Doc is to use displacy.serve. This will spin up a simple web server and let you view the result straight from your browser. displaCy can either take a single Doc or a list of Doc objects as its first argument. This lets you construct them however you like – using any model or modifications you like. The dependency visualizer, dep, shows part-of-speech tags and syntactic dependencies. There’s currently a known issue with the compact mode for sentences with short arrows and long dependency labels, that causes labels longer than the arrow to wrap. So if you come across this problem, especially when using custom labels, you’ll have to increase the distance setting in the options to allow longer arcs. color unicode Text color (HEX, RGB or color names). "#000000"
bg unicode Background color (HEX, RGB or color names). "#ffffff"
font unicode Font name or font family for all text. "Arial"
For a list of all available options, see the displacy API documentation. Long texts can become difficult to read when displayed in one row, so it’s often better to visualize them sentence-by-sentence instead. As of v2.0.12, displacy supports rendering both Doc and Span objects, as well as lists of Docs or Spans. Instead of passing the full Doc to displacy.serve, you can also pass in a list doc.sents. This will create one visualization for each sentence. text = u"""In ancient Rome, some neighbors live in three adjacent houses. In the center is the house of Senex, who lives there with wife Domina, son Hero, and several slaves, including head slave Hysterium and the musical's main character Pseudolus. A slave belonging to Hero, Pseudolus wishes to buy, win, or steal his freedom. One of the neighboring houses is owned by Marcus Lycus, who is a buyer and seller of beautiful women; the other belongs to the ancient Erronius, who is abroad searching for his long-lost children (stolen in infancy by pirates). One day, Senex and Domina go on a trip and leave Pseudolus in charge of Hero. Hero confides in Pseudolus that he is in love with the lovely Philia, one of the courtesans in the House of Lycus (albeit still a virgin).""" The entity visualizer, ent, highlights named entities and their labels in a text. If you specify a list of ents, only those entity types will be rendered – for example, you can choose to display PERSON entities. Internally, the visualizer knows nothing about available entity types and will render whichever spans and labels it receives. This makes it especially easy to work with custom entity types. By default, displaCy comes with colors for all entity types supported by spaCy. If you’re using custom entity types, you can use the colors setting to add your own colors for them. The above example uses a little trick: Since the background color values are added as the background style attribute, you can use any valid background value or shorthand — including gradients and even images! Rendering several large documents on one page can easily become confusing. To add a headline to each visualization, you can add a title to its user_data. User data is never touched or modified by spaCy. doc.user_data["title"] = "This is a title"
This feature is especially handy if you’re using displaCy to compare performance at different stages of a process, e.g. during training. Here you could use the title for a brief description of the text example and the number of iterations. 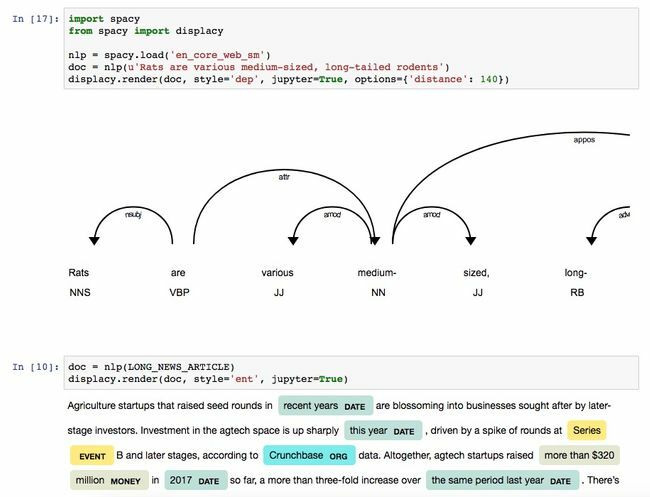 displaCy is able to detect whether you’re working in a Jupyter notebook, and will return markup that can be rendered in a cell straight away. When you export your notebook, the visualizations will be included as HTML. To explicitly enable or disable “Jupyter mode”, you can use the jupyter` keyword argument – e.g. to return raw HTML in a notebook, or to force Jupyter rendering if auto-detection fails. If you don’t need the web server and just want to generate the markup – for example, to export it to a file or serve it in a custom way – you can use displacy.render. It works the same way, but returns a string containing the markup. page=True renders the markup wrapped as a full HTML page. For minified and more compact HTML markup, you can set minify=True. If you’re rendering a dependency parse, you can also export it as an .svg file. Since each visualization is generated as a separate SVG, exporting .svg files only works if you’re rendering one single doc at a time. (This makes sense – after all, each visualization should be a standalone graphic.) So instead of rendering all Docs at one, loop over them and export them separately. file_name = '-'.join([w.text for w in doc if not w.is_punct]) + ".svg"
The above code will generate the dependency visualizations as two files, This-is-an-example.svg and This-is-another-one.svg. You can also use displaCy to manually render data. This can be useful if you want to visualize output from other libraries, like NLTK or SyntaxNet. If you set manual=True on either render() or serve(), you can pass in data in displaCy’s format (instead of Doc objects). When setting ents manually, make sure to supply them in the right order, i.e. starting with the lowest start position. If you want to use the visualizers as part of a web application, for example to create something like our online demo, it’s not recommended to only wrap and serve the displaCy renderer. Instead, you should only rely on the server to perform spaCy’s processing capabilities, and use a client-side implementation like displaCy.js to render the JSON-formatted output. Why not return the HTML by the server? The parse_deps function takes a Doc object and returns a dictionary in a format that can be rendered by displaCy. Using a library like Flask or Hug, you can easily turn the above code into a simple REST API that receives a text and returns a JSON-formatted parse. In your front-end, include displacy.js and initialize it with the API URL and the ID or query selector of the container to render the visualization in, e.g. '#displacy' for <div id="displacy">. When you call parse, it will make a request to your API, receive the JSON-formatted parse and render it in your container. To create an interactive experience, you could trigger this function by a button and read the text from an <input> field.